Who says designer saree blouses are to be worn only be film stars and fashion models? You too can wear them and transform your look entirely. Though this concept of designing blouses is a little recent in India, it seems to have caught on in a big way. Blouse designs are so many, today, that if you’re looking for a style for yourself, you’re going to be spoilt for choice. Designer blouses are made in silk, chiffon, organza, silk-cotton, georgette, lace, velvet, lace and cotton and sometimes can include precious metals and stones of one’s choice. They also have a lot of work such as zardosi, kundan, lace, thread work and mirror work on the back of the blouse and the sleeves. However, on high-necked or Mandarin collared blouses, you could find some work on the front part of the blouse too. You can team up a designer blouse with either a saree or with a lehenga and wear it to a wedding, event or high society party. Naturally, as a bride you want everything to be perfect on your wedding day – right from your clothes, makeup, jewelry, accessories and everything around you. One important aspect is your wedding ensemble that needs to be perfect and starts with your wedding blouse. Though you may choose your wedding saree with great care, you should also ensure that your wedding blouse is stitched well and that it accentuates your figure and your features well. If it fits you well, it will complement your individual beauty, but an ill-fitting blouse can ruin your look entirely. Deep Back and Neck Blouse: This blouse pattern has a deep back and is heavily embroidered, hence keeping the sleeves simple is apt. Take care to see that there isn’t an overdose of embroidery all over the blouse. If one part of the blouse (e.g. body) is heavily embroidered, the sleeves should have minimal embroidery. You can make your blouse just a little chic by adding noodle strings or dori to the back so that the blouse stays in place. Maharani Wedding Saree Blouse Design: You can choose the Maharani Style wedding saree blouse design to make a royal and classy impact. The blouse gets a rich look and feel, made in red and gold, with, in brocade. It can look fabulous when teamed with a red and gold saree or lehenga. Boat-Shaped Blouse: If you want to stay conservative in your appearance, go for the boat-shaped blouse. It looks good on a designer bridal saree or lehenga if you wish, and can look extra elegant with a Kanjeevaram saree or any other that you may choose. 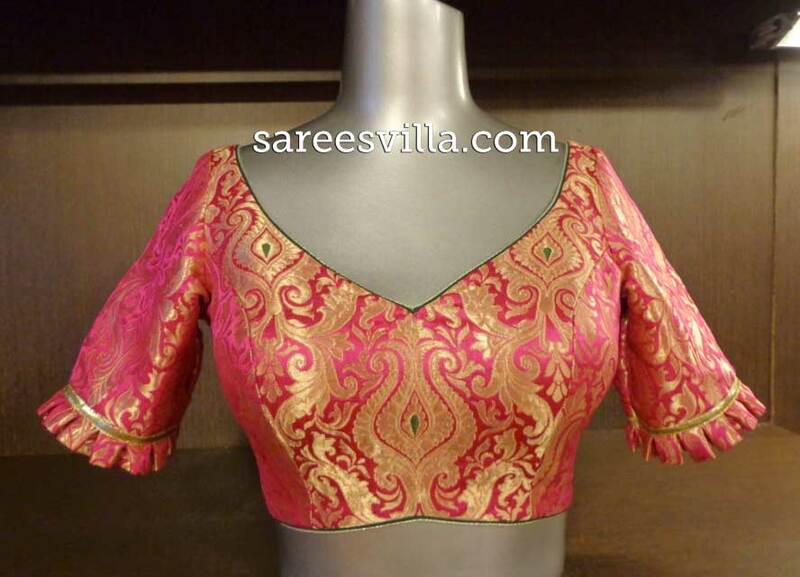 Banarasi Silk Blouse: Banarasi silk is one of the country’s finest silk materials, so a designer wedding blouse of this material couldn’t look anything but exquisite. The material is woven in silk with gold or silver zari and embellished with floral motifs. This material is rich and the final effect is heavy and just right for a bride. You can team up your designer Banarasi silk blouse with the saree of your choice for a unique look, but for the ultimate in Banarasi silk, booti work is nothing short of a classic. If the back is held together by some gentle strings, it would create a dramatic effect. V-Cut Blouse: What looks to be a simple design can actually be a stunning piece of artistry. A deep V-cut at the back shows off your gorgeous back and your shoulders too while giving you some sizzle too. 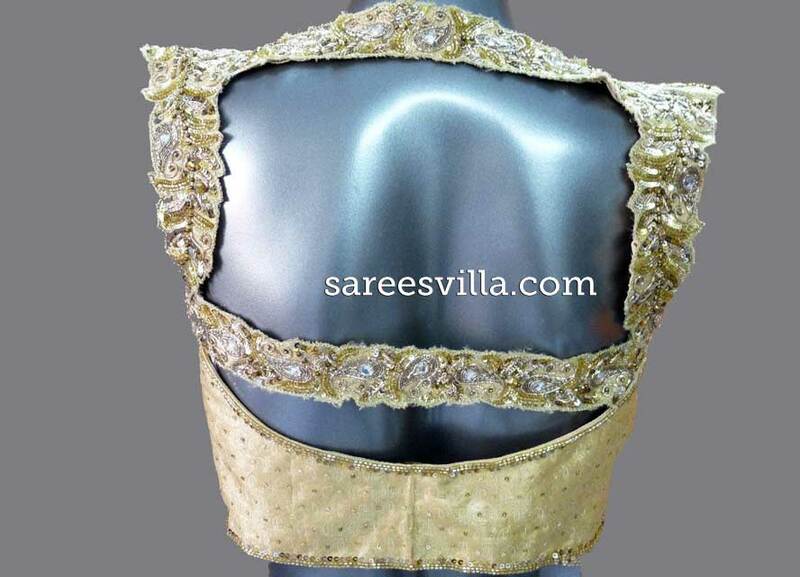 Backless Saree Blouse: With your kind ofpersonal style and panache to carry off a backless saree blouse, shouldn’t you be considering getting yourself one? This pattern is both simple and bewitching with its U-cut at the back and a thin string holding the blouse together. At the base of the blouse is a band and for classy embellishments, a few semi-precious stones that will twinkle all evening while you get all the attention. Rectangular Cut Saree Blouse: This innovative saree blouse design comes with two sets of noodle strings that hold both sides of the blouse together at the nape of the neck and below. If made out of lace in an attractive color or in dull gold, it can work wonders for the wearer. Maharani Style Blouses: Depending on your figure and choice, these Maharani Style blouses can be made more effective with heavy embroidery and sleeve lengths. It can give your wedding saree a rich and royal look, hence the name Maharani. Team a royal red blouse and saree with your heavy diamond and gold jewelry and you’ll look all the more radiant. Round-shaped Blouse: You can add a dimension to this common neck pattern. The round neck can be embellished by adding brocade border to the base or strew sequins all over it. Halter-Neck Blouse: If you’re going to a semi-formal party, you can wear a halter-neck blouse. How low your blouse is at the back is something for you to decide. Have a broad strap at the back, if you like. Net Blouse: You can choose from a rich variety of shades in net to match your chiffon or net saree. A simple and lightly embroidered net blouse will give you a quiet dignity. For a party, choose an evening color like red, maroon, navy blue or brown and set the night on fire. How to Find The Right Petticoat For Saree?